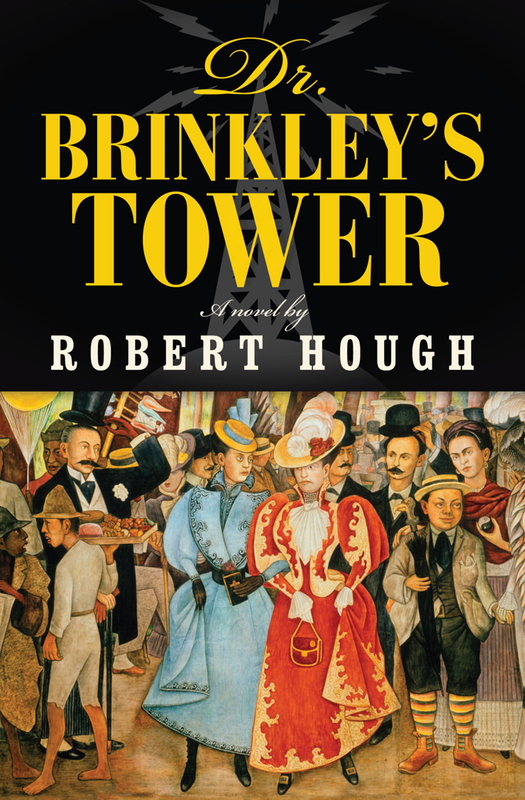 Dr. Brinkley’s Tower is a lush, beautiful novel about Mexico in the 1930s. The tiny town of Corazon de la Fuente has just survived a long, bloody revolution, the scars of which are beautifully illustrated in the condition of a mirror in the opening scene. A century of the Ramirez family’s use has created “undulations” in the glass and “a spidery hairline crack near the bottom,” but the “real dissolution” is the faint, sour smell that still lingered from the time Francisco Ramirez’s father hid the mirror under fermenting wheat to keep it away from government soldiers during the revolution. It is easy to lose oneself in Corazon de la Fuente. Hough’s writing portrays the flavour of the small town beautifully. We are overwhelmed with the sights and sounds of the town coming together for a lucha wrestling match, our ear quickly becomes attuned to a natural blend of Spanish and English, and we are absolutely captivated by the fragility of this town’s innocence. At times, Hough gets heavy-handed with his symbolism. For example, a character describes tequila as “the taste of Mexico, captured in a glass.” What an apt, beautiful and evocative metaphor! Unfortunately, I found its impact diminished by the almost overbearing two pages of description that preceded it. That being said, I enjoyed the language overall. The publisher’s description compares Brinkley to Gabriel Garcia Marquez, and while the novel isn’t magical realism at all, there is a strong sense of nostalgia, and the potential for magic, throughout. Central to the story is the romance between Francisco Ramirez and Violeta Cruz. I love, absolutely love, this love story. Francisco’s Quixotic devotion to Violeta is simply endearing, and I hated Dr. Brinkley before he even appeared, simply because I knew from the publisher description that Dr. Brinkley will catch Violeta’s eye. Violeta is torn between the wild animal passion she feels for Francisco, and the escape from Mexico offered by a relationship with Dr. Brinkley, so while I was rooting for Francisco all the way, I did understand her dilemma. Hough does a fantastic job portraying the town in its socio-economic context. Because Corazon de la Fuente is poor, and poorer still for the effects of the revolution, Dr. Brinkley’s radio tower does appear as a god-send, providing jobs and enticing foreigners with deep pockets to spend money in the town. I grew up in the Philippines, where many live below the poverty line and, unlike in Canada, there is no social safety net to ensure everyone has food, housing and education. I was struck by how relevant this tale of 1930s Mexico can still be relevant today. After an incident where a contest literally leads to a riot over gumballs, Violeta realizes how much she longs “to live in a place where a simple contest didn’t turn into a showcase for violent degeneracy.” It’s a sad state, yet I remember an incident years ago where people were trampled while trying to enter a contest for money. Poverty leads to desperation. – I am in Mexico, said the mayor in English. – And you’re in my country, pendejo. My ARC has that passage underlined and, in the margin, a scribbled “Yay mayor!” It’s an odd form of racism, yet it’s all too prevalent. Growing up in the Philippines, I remember how many skin whitening products are advertised, and also how much more intimidating it is to be berated in English rather than the local Tagalog, simply because the use of the English language is viewed as intellectually superior. I remember a story my aunt once told me, about a sales clerk who signalled for a tourist to jump the queue simply because he was Caucasian. The tourist was embarrassed and refused to do it, but it bothers me that it was the Filipino sales clerk who slighted other Filipinos in the first place. So when I see the mayor of this tiny (albeit fictional) town stand up for himself, I raise my glass to him. One of my favourite passages in the book. I love that a plain woman has such a vital role in the town, and precisely because of her plainness! I also love that the molinero, a Don Juan all his life, sees her beauty, and falls in love with her. It’s a beautiful romance, and one that made me cheer. Hough makes you cheer for the characters, and for their town, as they struggle against the compromises imposed by “progress.” I especially love how relevant this story feels, even as I felt transported into the past. Above all, I fell in love with Corazon de la Fuente and with Francisco, Violeta, the mayor, at all their neighbours. Stay tuned to my blog tomorrow for a Q&A with author Robert Hough! WIN A COPY OF DR. BRINKLEY’S TOWER! Would you like to be transported to 1930s Mexico? Win a copy of Dr. Brinkley’s Tower, courtesy of House of Anansi! This entry was posted in Book Reviews and tagged 50BookPledge2012, Anansi, ARC, Fiction, Giveaway, Historical, Romance by Jaclyn. Bookmark the permalink. I haven’t yet read your review, but I have to say, BUGGER, Jackie, you always beat me to the punch. You’re the only reviewer out there I know who can keep up with the books you receive and do the reviews in a timely manner! Oh, this sounds utterly magnificent! I’m off to South America on my honeymoon, but unfortunately doubt I’ll get up to Central American in order to see Mexico (I’m from Australia, not the US, so a fair bit of travel is involved! )…still I expect I may come across some similar scenes. Congratulations on your wedding, Stephanie! i would revisit the spring of 2010 because of Italy.